Mortgage Update Los Angeles: What is an FHA mortgage loan? Bill consults with many clients interested in getting FHA loans in the Los Angeles area. FHA home mortages are loans provided by a private lender, and insured by the Federal Housing Administration. The FHA mortgage rates are often lower than a conventional mortgage loan, and often require a smaller down payment, easier qualification guidelines, and easier access to lenders. For this reason, FHA loans are a good option for people with barriers to accessing conventional mortgage loans. 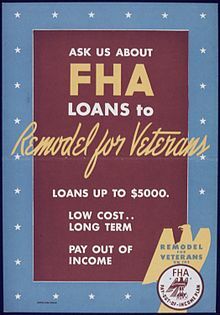 The program began as a response to the recession of the 1930's, and became a self-sustaining government program paid for by buyers through insurance premiums. The program has enabled new buyers to continue buying homes in the current recession from 2008 to 2012.